Provenance: by descent to Mrs Hilaire Hollick, Eaton Square, London until 1978, when acquired by Lane Fine Art; Christopher Rowley Esq. Tobias Stranover was born at Nagyszeben (Sibiu) in the northern foothills of the Transylvanian Alps in what is now Romania. He was the son-in-law of Jakab Bogdani, by whom he was taught as a painter of animals and still-lives. He was itinerant throughout Europe, visiting Hamburg and Dresden among other places before settling in England, where he stayed for the rest of his career. Bogdani had been the first to arrive in London in the 1690’s, where he was soon taken up by the court, painting a distinguished series of paintings for the Royal Family. He was joined here by his son-in-law (Stranover married Elizabeth Bogdani) and for the first decades of the 18th century the family provided the finest exotic bird and animal paintings in the country. 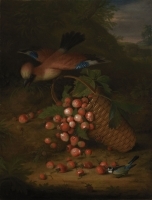 Stranover’s work has freshness and exoticism which is absent from the work of the few other animal painters working in Britain at this date – artists such as Francis Barlow and the elder John Griffier - and his widespread commercial success is readily understandable.